While anklets have been around since ancient times and are still a perennial in our culture, they’ve gone in and out of fashion for the past few years. We say they’re due for a big, fine-jewelry comeback! In recent years, “arm parties” of bracelets; “finger parties” of rings; hand jewelry; ears full of studs, earring jackets, ear climbers and ear cuffs; layers and layers of necklaces; and body chains. Every body part has been loaded with jewelry except for the leg. The wedding season is obviously the best season for showing off anklets. But you can also wear an anklet with a more trendy look— even jeans — or dress to pep up the outfit. Ankle bracelets are also a great way to add a splash of color to an outfit heavy in neutral colors. Buying flashy ones can be quite an investment, as a statement color isn’t likely to go with every outfit. Anklets are often paired with toe rings in India. How else can you draw attention to a new pedicure? Some traditional varieties are shown below. These can be paired with lehengas, sarees and silk ethnic dresses. Add some bling to your outfits with anklets/ ankle bracelets! Though we’re all buried deep down into our phones and can tell time with a blink of an I(phone), watches are a luxurious-fashionable-retro-must-have accessory for every woman and girl who have a penchant for details. Small retro watches are in right now, with both metallic as well as leather bands, minimal design, thin, sticking to your wrist. They look amazing as the single accessory of a basic minimal outfit. Think French-chic. Bigger watches in silver or gold, more on the masculine-statement-bling side are still hanging in there, which if you ask me, is absolutely great, because you can do both styles, depending on your outfit and mood. These ones look fantastic with layered bracelets, boyfriend jeans and blazers. Look at these various patterns that can go with your everyday wardrobe. Go get one for yourself now! In India jewelry is not only worn just for ornamentation purposes but also for its medical and therapeutic benefits as well. In India since ancient times, jewelry was designed, crafted and worn with great care thought and care. Indian jewelry was valued not only for beauty but also for the therapeutic,astrological and spiritual benefits it provided for its wearer. Maang Tikka worn from the crown of the head to the forehead between the brows and rests on the acupressure median of endocrine penial gland.Pineal gland activation will help the 6th Chakra reach its potential, which includes clairvoyance, psychic abilities, intuition,spirituality and enlightenment.To further enhace the benefits of wearing a Tikka it is advisable to use a Tikka set with crystals like violet/purple Amethyst or Clear Quartz. sheesh phool is worn at the crest of the hair from where the juda(bun) or plaits are tied.It presses on the urinary bladder meridian and helps control headache and sleeplessness. Nath or Nose Ring is connected to the heart meridian and increases the sense of smell and reduces nose infections.It is claimed that nose piercing also decreases pain of menstruation and eases the child birth. Kada or Bangles are worn on the reflex points of reproductive organs like uterus and ovaries and help regulate their functions. Ring worn on the first finger presses the reflex point of brain,on the second finger that of eyes,third that of ears and fourth that of heart. That is why engagement or wedding rings are always worn on the fourth finger of the left hand. Necklaces presses the points of the heart and lungs and help regulate their functions. Choker rests on the points of thyroid and parathyroid and helps regulate their functions. Kamarband or waist belt helps regulate the functions of spleen, ovaries,uterus and kidney. Payal or Anklets are mostly made of silver.They improve peripheral blood circulation and reduces inflammation of sole. By wearing silver Bichya or Toe Rings in second finger from toe menstrual cycle course is regularized with even intervals. This gives good scope for conceiving to married women. Also it is said just because that particular nerve in the second finger from toe, also connects the uterus and passes thru heart. Because of this, the constant friction caused while walking and doing all sorts of chores during a day, it revitalizes the productivity organs. Silver being a good conductor, it also absorbs the energy from the polar energies from the earth and passes it to the body, thus refreshing whole body system. Now you can be a therapeutic bride too! Know your head adornment ! Forehead Jewelry has been an important part of the Indian culture since ancient times.In India forehead center located between the eyebrows is the center of 6th “Agana Chakra”or “Indu/Chandra Chakra” or third eye.It controls and energizes the pituitary gland and is important for endocrine and nervous systems.The purpose of the forehead chakra is to help you to gain higher spiritual awareness. Here we look at the various Indian adornments and ornaments for the forehead. It is a beautiful ethnic piece of jewellery which adorns the forehead of a traditional Indian bride. 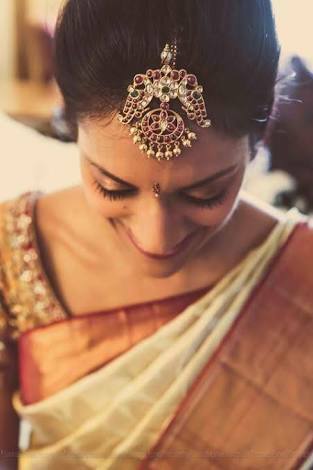 It is also a part of the 16 adornments worn to accentuate the bride’s beauty.The maang is the stringed portion which lays flat between the parting of the hair, while the tikka is the jeweled part which sits on the forehead on the spot on the forehead where you apply a tilak or bindi. It is a very versatile piece of jewellery and can be worn in various styles. The types of maang tikkas vary from region to region in India. -South Indian Maang Tikka is known as “Netti Chutti” is crafted out of traditional plain gold without any stones. Rajasthani maang tikka known as “Borla” has a rounded center is made from pearls , kundan/jadau and meenakari. 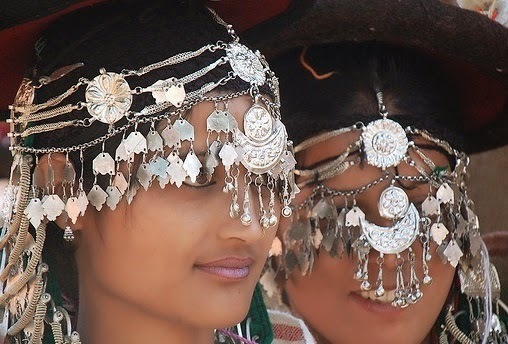 Women from Himachal Pradesh wear Chirri Tikka ornament on her forehead during Dussehra and other special occasions. Chirri Tikka is usually silver,enameled and has lots of bell drops. Jhoomar worn by Muslim brides is another forehead head ornament which is worn on one side of the hair, falling partly on the forehead like a one-side ‘mang tikka’. 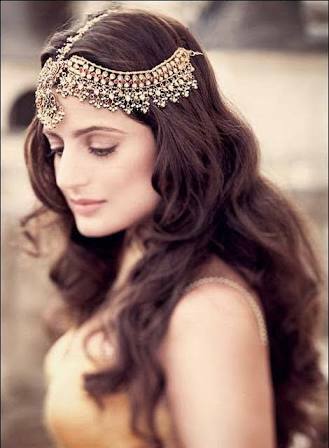 Matha Patti is another forehead ornament which is a extended variation of Maang Tikka. Also known as Shringar Patti, the central tikka is a flat piece suspended from the centre of the forehead while one or several chains hang along the hairline on both sides. Now which is going to be your head adornment this season?